Sometimes our bodies give us signs that something is not right. At times like these, we all need to pay attention. Two weeks ago I was talking on the phone (with someone I did not know) and suddenly I felt dizzy, my arms started tingling and my tongue couldn't keep up with my speech. I immediately hung up the phone and ran upstairs to swallow two baby aspirin. I knew something wasn't right but fortunately within a few minutes I felt fine. I thought for a second about calling 911 (and I have since promised my family I will do so if this ever happens in the future) but grabbed my purse and got in my car to head to the hospital. I was able to get my doctor on the phone and went to his office instead. He admitted me to the hospital for a million tests and the first 19 were negative (so I was feeling pretty healthy and good about things!). The last test found a small hole in my heart (called a PFO) which the doctor determined led me to have a tiny TIA, which is a minor stroke. The good news is that it was minor and there are no after effects. More good news is that it is 100% treatable with medication (no surgery needed) and I am going to be fine. The best news is that I discovered this and I now can prevent anything much worse from happening with medication. 1. Facial problems - such as drooping of the facial features on one side. 2. Arms - does one arm drift downward when you raise your arms? 3. Speech - Is speech slurred or strange? 4. Time - if you observe ANY of these signs, call 911 immediately. I was lucky and hope that you will all pay attention to these signs if your body calls out for help! Please share this information with your friends and family. It could save somone's life! 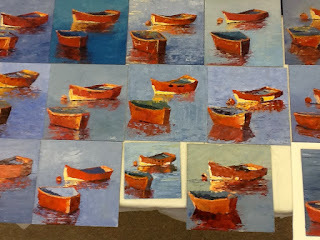 I am so fortunate to be able to share my love for palette knife painting! I taught two workshops this past week on two different coasts ... South Pasadena and Charlotte, NC. I Charlotte I had 16 wonderful artists join me for three days. We painted, laughed and had way to much fun! It seems that painting with the palette knife actually isn't that hard (right ladies?) and in three days color mixing can be mastered. The paintings created in this workshop were fantastic!